Do Cashews Come From A Fruit? It is tough to tell where a nut or seed originates from because all that most people see is the nice finished product from the store. People tend to pop the lid of the cashew container and enjoy the product without much thought to its origin. However, if you are here, you are likely wondering “Do cashews come from a fruit?”. This is an interesting question because when you think of a nut or seed like a cashew you likely are not thinking about a fruit as its source. Let’s dig a little deeper into what is a cashew to find out if it comes from a fruit. You may be surprised by the answer. 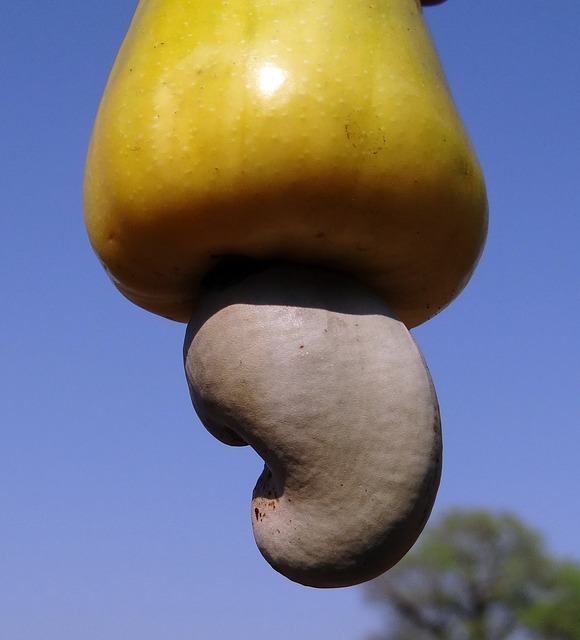 Cashews come from a tree that usually grows to approximately 40 feet. Sometimes the trees can be much larger but these trees tend to not produce as efficiently as the smaller trees. The tree produces a seed and a fruit that are connected to each other. As you can see from the photo above, the seed hangs at the bottom of the fruit and is not readily consumable. The consumable portion of the seed (the edible cashew) must be extracted from the hard outer shell. The seed must be heated and expertly shelled in order for the consumer to avoid the toxic resin known as urushiol that lies inside. Urushiol can severely irritate the skin like poison ivy. If consumed, it can be toxic. Check out the below video for more on the toxic nature of raw cashews. Extracting a cashew from its hard, toxic outer shell plays into the high cost of the product. It is much easier to extract the nut from something like a peanut, which is essentially only harvested, dried and then ready for consumption. 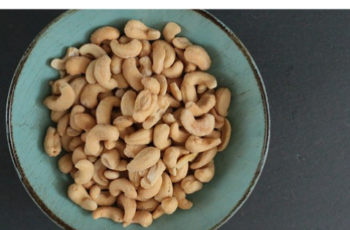 We should note that most of our readers are likely not going to come across a raw cashew or tree because they are mostly grown in Brazil, Africa, or India. Cashew trees thrive in tropical climates, therefore, if you were to come across one in the United States, it would likely be in a place such as southern Texas or Florida. What about the fruit? The fruit is known as a cashew apple. The apple can grow to about 4 inches long and is typically red or yellow in color. Often the seed which holds the cashew is harvested while the fruit portion is left on the ground to rot or to be eaten by livestock. The fruit spoils very quickly, within a day of falling from the tree, which makes it difficult to process since it does not ship easily. However, humans do consume this acerbic fruit that is very high in vitamin C. It is commonly made into jam, juices, vinegar, alcohol, chutney, or used as a flavoring.